One design. Three beautiful causes. Read through to the bottom to learn why. Just listed are three sparkling crystal awareness bracelets in support of organ transplant awareness, cystic fibrosis awareness and behcet's disease awareness. Choose from emerald green (Organ Donation Transplantation), amethyst purple (Cystic Fibrosis) or light blue (Behcet's Disease). The first bracelet to be designed in this series was the organ Breathe Free Organ Transplant Awareness Bracelet (B184-TX). This handcrafted beaded bracelet was designed with green emerald Swarovski Crystals, white pearls and accented with sterling silver fancy Bali beads. Finished with a sterling silver butterfly charm, awareness ribbon charm and our signature jewelry tag. Measures 7-1/2". Remember the butterfly is a symbol of lung transplant. Naturally, the second awareness bracelet to be designed was the Breathe Free Cystic Fibrosis Awareness Bracelet (B184-CF). Designed with a beautiful strand of sparkling purple amethyst Swarovski Crystals, pearls and that same sterling fancy Bali beads, finished with a sterling silver awareness ribbon charm and our signature jewelry tag. Measures 7-1/2". Purple is the awareness support color for cystic fibrosis (CF), which is often referred to as 'sixty five roses' by young children. The last design, Breathe Free Behcet's Disease Awareness Bracelet (B184-BD), features light blue Swarovski Crystals accented with white Swarovski Pearls, again those fancy silver Bali beads and finished with a sterling silver awareness ribbon charm and our signature jewelry tag. A sterling silver paw charm was added to this bracelet because it is my understanding that those living with Behcet's, who have pets, are comforted by their pet on their bad days. If you wish for the paw charm to be removed from the bracelet, simply indicate so in the comment box at checkout. Measures 7-1/2". Light blue is the nationally recognized ribbon color for behcet's disease awareness and support. You may recall Behcet's disease is an autoimmune disease that results from damage to blood vessels throughout the body, particularly veins. Most symptoms of the disease are caused by vasculitis (an inflammation of the blood vessels). Behcet's disease is not contagious; it is not spread from one person to another and it affects each person differently. So why did I use that same fancy sterling silver Bali bead in each design? And why are they call "Breathe Free.."? Well, with each of these diseases/illnesses the affected person is either fighting to breathe easy each day and/or battling pain, discomfort and sadness. It is my wish that each of these one of a kind bracelets will give HOPE to each of their wearers. Hope that one day, they will, Breathe Free....pain free....and leading happy, healthy, carefree days! Cristy contacted me about designing a custom aunt bracelet for her to give as a gift to her sister, Wanda. She wanted to celebrate her sister for having such a big heart and for making a difference in the lives of both her niece and nephew. Being an aunt myself, I felt a personal connection to this design. I know I am proud to be an aunt (and I'm a darn good one too, if I don't say so myself! *smiles*) and I wanted Wanda to feel the say way, every time she wore here handmade beaded bracelet. More importantly, this symbolic custom bracelet will be a keepsake Wanda could treasure for a lifetime. So, I decided to make an irresistibly, elegant and eye-catching crystal and pearl handmade beaded bracelet. Wanda's Custom Swarovski Crystal Auntie Bracelet (B182) features a full strand of sparkling Swarovski Crystals, Pearls, sterling silver beads, Bali with sterling silver letter beads that spelled out 'Auntie', centered in the design. I finished it off with our sterling silver signature jewelry tag. You are very welcome Cristy! It was my pleasure to design this special bracelet for you. Our very first personalized bracelet design was a birthstone bracelet, topaz for November, if I remember correctly. We then designed an elegant MOM beaded bracelet, of sterling and Bali, and a customer requested to have it customized. She wanted it to be an AUNT bracelet that she was giving as a gift. Since then, our personalized bracelets collection has grown. Over the years, Crystal Allure has designed and personalized timeless keepsake bracelets that include, Sweet 16 bracelets, Auntie bracelets, Name bracelets, Mothers Bracelets and more. The possibilities are endless when it comes to personalizing crystal bracelets. We love to design and offer these personalized bracelets because, well, they're handmade, unique, elegant, feminine and the perfect keepsake to celebrate mom, grandma, sisters, friends, aunts, even pet parents. These bracelets are designed by you, which makes them even more special! So we've compiled them into our newest jewelry collection, Designed by You, timeless keepsake bracelets by Crystal Allure Jewelry. In this collection, we offer a variety of designer beaded bracelets you can customize with crystal colors, the number of strands, any personalized names. We've added a few new categories and have begun restocking the bracelets offered under this collection. If you don't see what you are looking for, please feel free to contact me for a custom design. In the coming days/weeks, we'll introduce each bracelet currently offered in this collection along with our recent sparkling custom, designed by you, designs. Luck o' the Irish SALE! You don't have to be Irish to love the color green. And how can you not love the color green? The color green can mean so many things. Green is the color of nature, fertility, life. It is a restful color and symbolizes self-respect. Green is the color of balance and also means learning, growth and harmony. I see green as a "neutral" color. One that can be used anywhere and can even replace your classic blacks, browns and beige colors in your wardrobe. It's also a very chic color. And for all you brown-eye girls out there, like me, the color green looks great on your eyes! When I want a pop of color and to make my brown eyes brighter, I simply slip on a beautiful Crystal Allure necklace design in green. 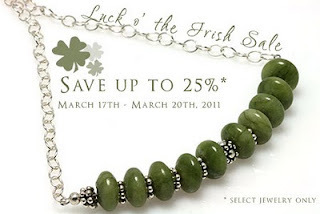 Have a Happy St. Patrick's Day, stay safe and feel free to take advantage of our 4 day sale on select green beaded jewelry! When I first started a design concept for Caregiver Awareness and Appreciation, I hadn't truly realized, or thought about, how many caregivers we encounter each day. The reality is, just about everyone is a caregiver these days. From aging parents to babysitters, pet caretakers to even families who take in children that are not their own. So I am very excited to present the Guardian Angel Caregiver Awareness Bracelet (B196) because I too, fall into one of the groups listed above. And I wouldn't have it any other way! Indeed it takes someone special to be a caregiver, or so I'm told. But I don't look at it that way. I have a big heart with lots of love and I'm only too happy to share that love with someone else who may need a little of it. I was so thrilled with this design, that in my excitement I just realized I forgot the awareness ribbon charm. Will have to go back and add that on. :-) What was so great about having completed this beaded bracelet, is that it inspired an idea that could span just about any awareness cause! (you'll have to stay tuned to the blog for a future post on that inspired idea). 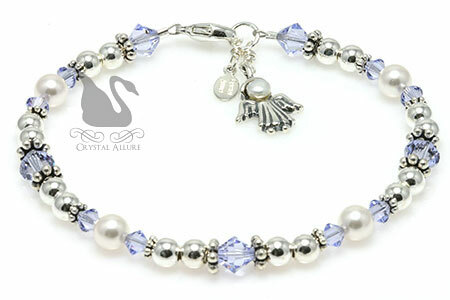 This lovely bracelet features lavender Swarovski Crystals, pearls, Bali and sterling silver. Finished with a sterling silver guardian angel charm and our signature jewelry tag. Now you can show your appreciation for that special caregiver in your life and in turn, they will be raising awareness each time they wear their sparkling, feminine caregiver bracelet. To date, I have not had a transplant and do not need one. But, that has never been a road block in understanding how those who need, or have had, a transplant might feel. All I have to do is close my eyes and imagine, for even just a second, how life altering (and awe inspiring) transplant can be. Of course, I'll always wonder how life would have been had my oldest brother received his transplant. So, I tend to get excited and attached to every transplant design I create. Yet, each time I create a new transplant awareness bracelet, I am taken aback at how personally attached I am to it. The Exclusive Winds of Hope Organ Transplant Awareness Bracelet (B192) represents the many twists and turns one faces in their road to transplant and how it can leave you feeling a little "breathless". The bracelet encircles the wearer with hope and strength to ride the winds of hope, no matter where they take you, on your journey to and through transplant. Our unique handmade awareness bracelet features a "whirlwind" of emerald green Swarovski Crystals on a "swirling" path of sterling silver links flanked by Swarovski Pearls and sterling silver. Finished with a sterling silver awareness ribbon charm and our signature jewelry tag. Melissa contacted me in early February to create a custom HPV Awareness Bracelet for her. She wrote, "I really thought it would be easy to find one, but it wasn't." Melissa liked the style of our Breathe Organ Transplant Awareness Bracelet (B159). She especially liked the Bali beads and palace green opal Crystals by Swarovski in the design. This provided a great starting point for her custom design. As most custom designs go, I generally have almost an instantaneous design idea, or specific component I would like to use, soon after I speak with the customer. That held true in Melissa's case as I knew I wanted to incorporate the light green peridot crystal pendant bicone bead. Melissa gave me artistic freedom to develop the design and although it took a little time to incorporate all her preferences with my vision, I think the end result is simply beautiful! This is the first request we've had for a cstom human papilloma virus (HPV) awareness bracelet. Even though Melissa may not have initially found the bracelet that represents her cause, that is exactly what Crystal Allure Jewelry specializes in -creating custom jewelry and beaded awareness bracelets, just for you! Enjoy your bracelet Melissa and thank you for shopping Crystal Allure! Light Green is the nationally recognized ribbon color for Human Papilloma Virus (HPV) awareness and support.